Indochinese Tiger (Panthera tigris) is believed to remain in small, scattered groups, or even very few individuals in Thailand, Myanmar, Vietnam, Cambodia, China, and Laos. Although the species used to be widespread in the 1980s-1990s, tigers have experienced a drastic population decline of more than 70%. In 2007 there were believed to be well below 2,500 individual Indochinese tigers remaining, with no sub-population above 250 individuals. More recent estimates indicate there may be as few as 350 individuals in the wild. Tigers all around are seriously threatened by hunting, as there is a growing demand for tiger bones for medicinal uses and for tiger skins, with estimates indicating that there is at least one tiger being killed each week. Inter habitat, tiger prey is also significantly hunted, leaving less available food to sustain the existing tiger populations. 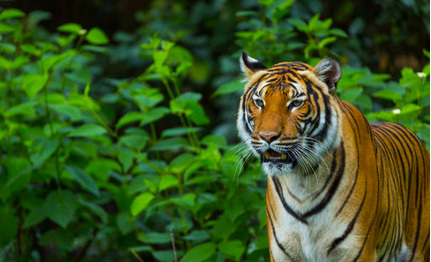 Significant habitat loss is another threat to tiger survival, with conversion of suitable habitat for agriculture, forestry, and industrial plantations. From 2006 to 2012 PRCF Cambodia conducted research on Indochinese Tiger and their prey to identify conservation needs and suitable interventions in the landscape of Lomphat Wildlife Sanctuary. We trained sanctuary officials and members of local communities to patrol critical conservation areas in order to stop illegal hunting of tigers and tiger prey. Our last sign of tiger in Lomphat Wildlife Sanctuary was in late 2010, with tiger tracks at an evergreen forest site with the protected area. No additional signs or reports on tiger have documented since then, and our conservation management activities in the landscape have switched focus. Our latest work in the sanctuary related to conservation management for tiger prey, hoping for a future rebounding of tiger population in the Eastern Plains Landscape, was to prescribe an internal zonation system for the sanctuary, safeguarding critical tiger and tiger prey habitat.